The Ruffwear Swamp Cooler uses natural evaporative cooling to keep your dog cool. Soak it in cold water, wring it out, and fasten around your dog. Evaporative cooling exchanges the dog's heat as water evaporates from the coat's reservoir. Temperatures drop through the phase transition of liquid water to water vapor, mimicking the cooling effect of humans' sweat. The Swamp Cooler's light color is designed to reflect heat from the sun. Combined with the evaporative cooling effect, the Swamp Cooler will keep dogs comfortable and ready to run that extra mile. Auto-lock buckles on each side of the jacket provide easy on/off. The Swamp Cooler is available in 6 sizes. 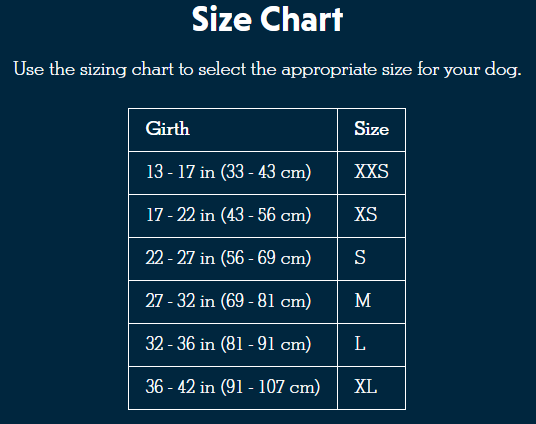 Select the correct size based on your dog's girth (measurement around the widest part of the rib cage). X-Large: 36-42 inches (91-107 cm).